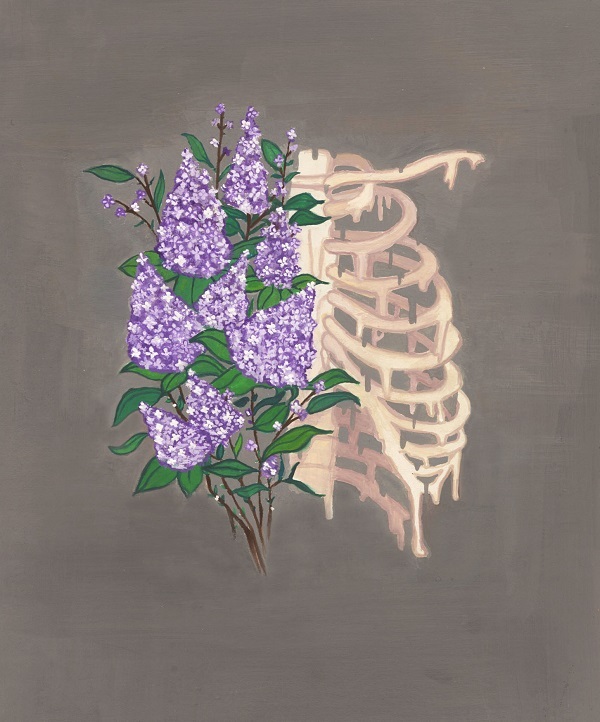 I’ve decided to tattoo lilacs onto my skin for I need to remember to grow. I’ve decided to lie on this bed, to listen to the growl of the tattoo gun as it pierces my ribs and indents me forever with a full bloom. I squeeze my cousin’s hand. It hurts, but she begins to tell me a story about how my old cat would always get pregnant right before we were going to get her fixed, so I laugh and everything seems a bit better. I’ve decided to do this because when winter manages to last for lifetimes, I feel as if I’m trapped in a certain darkness. As if I’m frozen within myself, no matter how much the shower water burns my skin. Four o’clock is as lonely as midnight. The freezing wind trespasses through my ungloved fingertips and travels through my bloodstream until I am an ice sculpture, incapable of moving. The emptiness consumes me, a black hole absorbing any form of light. I try to ignore it. I try to prevent it. I try to destroy it, but it returns like a second-coming, growing stronger each time. Like swelling waves, it crests higher, crashes harder, and each winter, breathing becomes more difficult. I look at all those who smile so effortlessly and I offer them my icicle of a spine. “Crack me over your knee,” I say. There’s a tree in my backyard. It pushes out buds that persist through the insistent morning frost. Soon, purple flowers––lilacs. Their scent brands my street, just like a favourite aunt’s perfume, enveloping me as she welcomes me with a hug. When the lilacs bloom, spring has arrived. My ice-struck heart is placed in a cup of warm milk. In the crook of a mother’s neck. In a bed of honey. After the longest night, I am bathing in sun. I begin to thaw. I lie on the chair and wince. “I’m sorry, but I’m going to have to pin you down so you don’t shake,” the tattoo artist tells me. I nod and welcome this stability that I have always needed. Here is my wink to all of those who have disregarded me. My final glance at the teacher who sent the child who threw up in the trash home but claimed that “going for a walk” should be enough for my flaming mind and shaking body to heal. My last wave to the screams within me that only escape in silence. I am flipping through film negatives, choosing which to bring to life. Throw out the image of me at night, staring into the dark, begging for morning and being incapable of getting out of bed once it arrives. Trash the snapshot of my fake laughter to my friends, which I wonder if they know is my translation for what the English call “Help”. Burn the photograph of me lying on the cold tile of the bathroom floor, seeing how long I can hold my breath before I finally begin to feel lightheaded. The tattoo is finished and although my skin burns, this is my melting. I am the ice cream cone in a child’s hand on the hottest day of summer. I am the first kiss shared between a pair of fourteen year olds underneath the bleachers during recess. I am the hot bath you take when you have a cold, the kind that eases your aching bones and releases all of the bad within you. I am aware that as winter reappears, I will be ice-struck once again. This time, however, I will walk into the cold and place my feet into the snow. My lips will purple and my hair will chill, but the lilacs imprinted on my ribs will burn a hole through me and burn a hole through this sentiment and burn a hole through it all. I will allow myself to become transparent and I will allow myself to matter and I will allow myself to feel, no matter how hard this frost tries to gnaw at every part of me. This inner winter may feel forever, but my lilacs, my spring, my rebirth, are now permanent. When I breathe in, my lilacs will rise as my ribs expand. I will then let it all out in a visible puff of cold air. Cheyenne Skurczak is a first year Literature student at Dawson College. Writing is her greatest passion, and she hopes to become a published author as well as an English teacher. She intends on promoting self-love, optimism, and independence. Ahlyssa-Eve Dulay is an aspiring illustrator with a passion for animation, comics and fashion. You can view more of Ahlyssa's work through the following link: https://www.instagram.com/aylee_d/.